Can you believe it’s June already? Summer’s just around the corner! I’m excited to share some of my favorite things from the past month with you, ranging from clothing, accessories, and beauty items to home goods, multi-media picks, and food. I couldn’t think of anything new I’ve been wearing this past month that I haven’t already shared with you in previous favorites. The “momiform” is a real thing! For me, it’s jeans with a tank top layered under a loose v-neck tee and comfy sneakers. Boring, I know, but oh so practical. I thought I’d share a peek at my diaper bag instead as there’s been a lot of interest in that. I plan to do a proper post dedicated to what I pack in mine very soon. ❊ Skip Hop Forma Backpack – I searched far and wide for the perfect diaper bag and finally settled on this backpack. 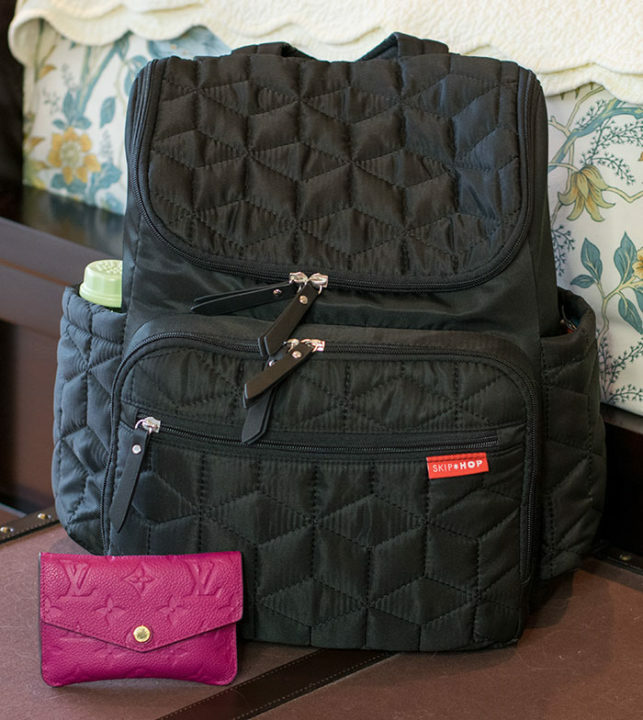 It meets all of my diaper bag needs: lightweight and easy to use while babywearing with great built-in organization. I love the teal interior which makes it easier to see items inside. I find I don’t actually carry this with me on a daily basis since my daughter’s wake times are still quite short and we don’t go out for long, so I leave it in the car most of the time. So far I use it the most when we go to someone’s house or when traveling and it works out great. More details on what I pack in it soon to follow. ❊ Louis Vuitton Monogram Empreinte Key Pouch – Don gave this beauty to me as a birthday gift this year and it has come in so handy as a new mama. I keep my most used cards, ID, health card, my car key, and a some cash inside. I like to babywear my daughter when running errands and this pouch fits in my back pocket so I can keep my hands free. 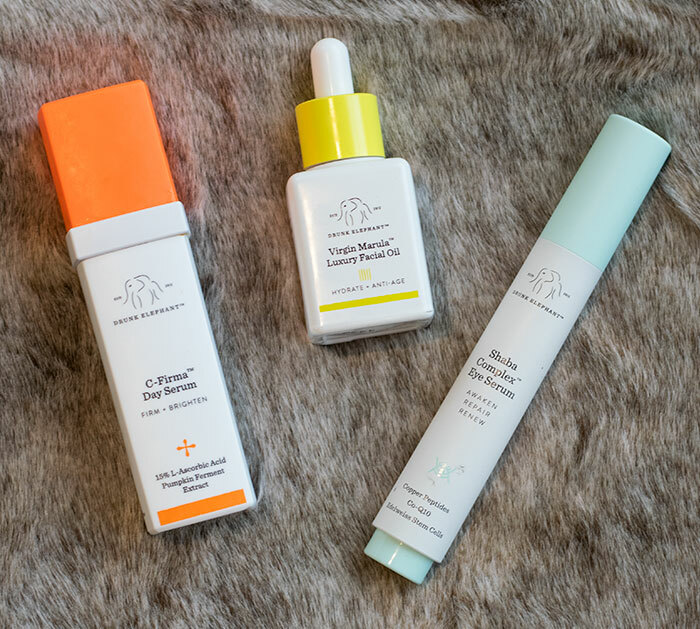 I was first introduced to the Drunk Elephant brand of skincare when I received the C-Firma Day Serum in a Popsugar Must Have Special Edition box last spring. I instantly fell in love with the product. I felt like it visibly reduced the fine lines on my forehead. I switched over to Juice Beauty skincare after I became pregnant as my skin cleared up and I wanted (and only needed) to use very mild products. My skin started acting up a little about three months postpartum and I remembered how much I liked the day serum, so I took advantage of the Sephora spring VIB sale to buy a bunch of the Drunk Elephant products to try. Guess what? I absolutely love them all. In addition to the day serum, two of my other favorites include the Virgin Marula Luxury Face Oil, which I use at night, and the Shaba Complex Eye Serum, which I use morning and night. I’m thinking of posting an updated skincare routine this summer featuring these products and some others from the line. It’s always great to find effective skincare formulated with high quality ingredients that is safe to use while pregnant or nursing. We go through a lot of hand soap with an infant in the house. I like how gentle the Up&Up soaps are. My favorites are the Aloe Vera and Milk and Honey scents. They get the job done well without drying out my hands. It’s nice that you can buy them in bulk size and decant into your own dispensers as well. I fell in love with the Threshold Oil Can tall and short soap dispensers on a Target run last month and I now have one at every sink in our house. ❊ Episodes – Don and I started watching Episodes earlier last month. We love it! I think it’s absolutely hilarious. I like that the characters are clumsy and flawed enough to be likable even though all of them do despicable things at one point or another. Matt LeBlanc does an amazing job playing a parody of himself as a self-destructive has-been actor struggling with the reality that his hit tv show days are behind him. I love the dry and sarcastic banter of the British couple who play the writers of LeBlanc’s new sitcom. I can always count on the show to make me laugh. ❊ YouTubers – I had the pleasure of meeting some really sweet fellow Erin Condren Life Planner lovers at Geaux Wild in New Orleans. I was introduced to some fellow YouTubers who make awesome videos that I wanted to share. JenPlans is a sweet SAHM with three littles and a true blue Erin Condren fan. She gives great reviews of EC products, which features her super neat handwriting! I sat next to CiaraHoneyDip at a special dinner one night and had the best time chatting with her. She has an amazing lifestyle channel that covers topics ranging from health and fitness, beauty and product reviews, home tours and life advice, and of course, planner videos. If you love planner videos, please consider checking out these two channels and showing these amazing women some love. It’s been awhile since I’ve had a Starbucks obsession, but it’s back and it’s sooooo good. I started taking my daughter and pup for long walks into town when the weather warmed up last month. 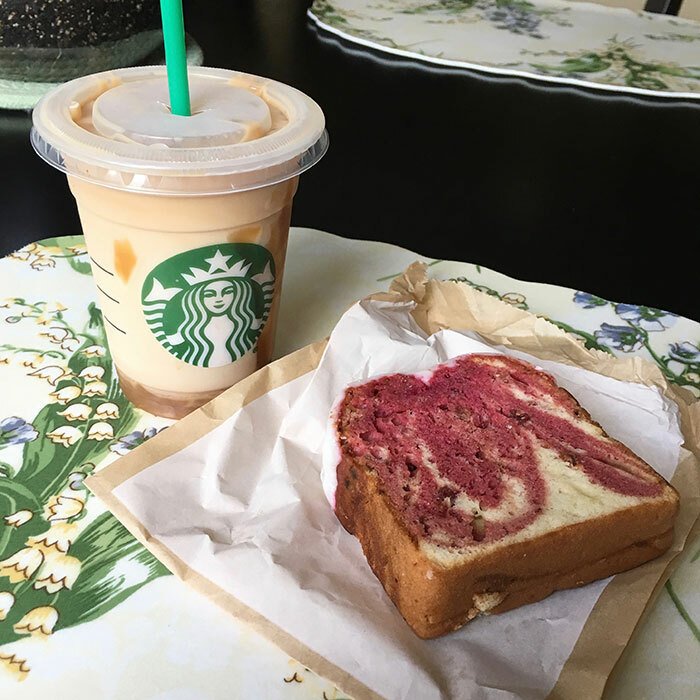 Starbucks is the perfect halfway point and pitstop for a snack. My go-to at the moment is a tall iced decaf caramel macchiato with extra caramel (that part is key!). I’ve been off caffeine for several years now so my tolerance for it is especially low. You’d think I’ve had three shots of full strength espresso after one of these decaf drinks. I’m bouncing off the walls! It is such treat and an extra special one when paired with the delicious raspberry loaf. The icing at the top is my favorite and I save that for the last few bites. So delicious! It’s giveaway time! As you may know, I’m a big Erin Condren fan. The new Life Planners and accessories launch today! I wanted to share the EC love with some of you. The May 2016 Favorites Giveaway will run until Wednesday, June 8, 2016 at 6 PM CT. The giveaway is open internationally. All entrants under the age of 18 must have parental permission to enter. FIVE winners will receive a $200 ErinCondren.com electronic gift card. I would love to know what some of your May favorites were if you care to share. Cute diaper bag! I wanted to suggest checking out Kelly Moore camera bags if you feel like switching it up. I use it for my camera and lenses but apparently lots of people use them for diaper bags. They come with pads inserts that you can move. It seems like it would be something you’d like! I can’t see the widget 🙁 I’ve read and read the blog post numerous times. Am I missing it? Ack, I forgot to put it in! All fixed now, you should see it. So sorry about that! You’re so beautiful Jen. Inside and out ❤️ God bless you and the family. Great post Jen! I always love to know what you have been enjoying over the past month! I like to go hands free from time to time whether it is on a run or just running errands. This is a local company in my city and I cannot say enough good things about them, thought I would share with you! Looking forward to your diaper bag video! As I said, I don’t use my bag much, and they grow so fast that once you’ve figured out what/how to pack, you’ve got to figure it out all over again! Thanks for sharing your experience…it’s still new to me so I haven’t been able to test it out much yet. I agree the fabric could be sturdier. Mine fits under my stroller but I actually keep a pouch there with necessities just like you. Mostly the bag lives in the car although it was perfect for our first air travel experience. I was curious if you still used your Midori Travelers Notebook? I watched your video(s) last year, which inspired me to get my own, so I was just wondering if there was an update how you use them now, if any differently? Nope! The only thing you have to do to enter is answer the poll question (first entry option). Everything else is optional for additional entries. I love your videos! Can you do an updated car organization video now that baby girl is here? Nothing much has changed in the car except for the carseat and my diaper bag living there, but when something does change (more when she’s older I’d imagine), sure! I am six and a half months postpartum and went through a similar “what is going on?! ?” moment with my skin… and now I am also using Drunk Elephant products! Aren’t they fabulous? I use the Juju bar in the AM, followed by the B-Hydra gel and Umbra sunscreen; before bed I use the Pekee bar (which actually takes off ALL my makeup) followed by the B-Hydra gel mixed with a few drops of the Marula oil. I have sensitive skin that doesn’t always respond well to actives, so I’m gradually adding in the night serum every other day and will probably try the day serum if that works out. So far, so good, though. 🙂 I plan to try the rest of the line this year and would love to hear your thoughts as well! I am on the Drunk Elephant train too! I haven’t tried the eye serum yet, but that is next on my list to purchase. Can’t wait for the Sephora sale in November so I can stock up. Jen, I just want to applaud you on your public speaking. I wasn’t there to witness it but I know that was huge for you. I remember you talking about your anxiety with crowds and new people when you first started YouTube. Congratulations on overcoming that fear! I stumbled upon your blog when I was searching for the pocket printer. Great review and video on that as well. I too love that milk and honey soap! Smells so good! Thank you for the giveaway as well. I have been searching for a new skincare line since my skins needs are also changing and I am excited to try these out! Great video and I’m so sad to have missed you at Geaux Wild! 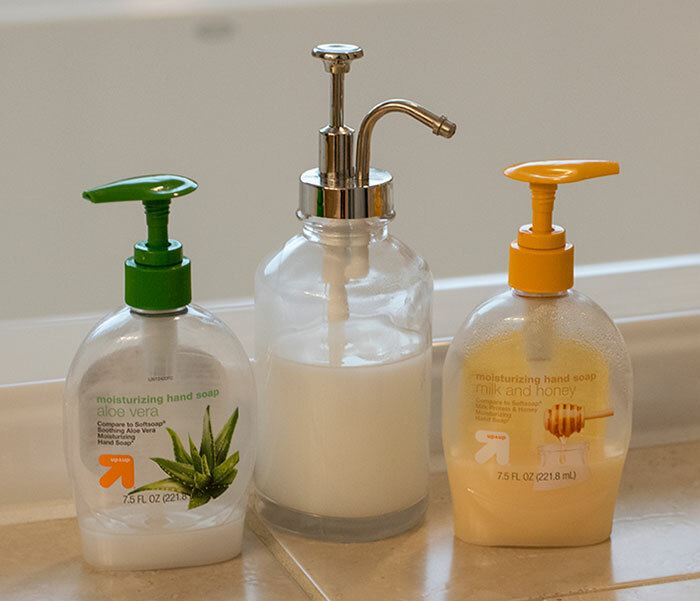 I love those soap dispensers, I’ve been looking at getting something similar for our bathrooms, I’m fed up of buying the usual plastic bottle jobs, they just create more waste. I can find nice reusable dispensers, what I can’t seem to find locally is large refills! Love hearing all the CC updates! Hey Jen! Can you do a Q&A video soon? I have a lot of questions for you as it has been a super long time since you last did one. Would love to see one really soon! Maybe it can be your next video? Let me know! I enjoyed your Trader Joes haul on snapchat the other day. Can you do a video Trader Joes haul soon? I think those kinds of things I’ll just put on Snapchat for now. Glad you enjoyed it! What are your favorite and least favorite items from Trader Joes? I personally LOVE their corn bread mix (to die for) and their dried baby bananas! I really like their flat sandwich breads and English muffins. Really good! I am a new subscriber and love watching your videos especially the “favorites”! 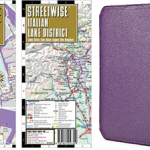 I love planners and would LOVE to get an Erin Condron one, but just haven’t yet as I have a hard time justifying the price! 😉 I am a teacher and have also heard great things about the teacher lesson planners. My daughter just graduated from college and got her first teaching job and I would love to surprise her with a new planner! Your giveaways are so generous!!! I do not have a Twitter account or Instagram account and am wondering if we have to have all those social media accounts to be considered for your giveaways?? Nope, those are just extra ways to enter. All you have to do is answer the poll question to be entered. Good luck! Great! Thanks so much for the reply! When did you first become into blogging? What did you study in college? Have you always known you wanted to become a blogger? How did you first get into blogging/vlogging? What prompted your interest? Are you happy with blogging as your career? Does Charlotte ever get together with Emily’s son? It is so great that she has a cousin her own age and that they will get to grow up together. Can you film them on a playdate soon? It would be cute to see them playing together! Hi Jen! I’ve been eyeing that key pouch for awhile now. Looks so pretty. And I hadn’t heard of Episodes, can’t wait to check it out! Hubby and I love watching comedies 🙂 That Starbucks looks so delicious…we’re about to move and I hope there’s a Starbucks nearby! I like those 2 YT channels as well; I’m really trying to get back into keeping up with everyone’s blogs and channels, I fell off the wagon for awhile but I just love seeing what yall create <3 Jen, you are so generous. Thank you so much for hosting this lovely Erin Condren giveaway. You're always doing giveaways and I'm going to try my luck, it's my golden bday month! 😉 Have an amazing day! I am so glad I discovered your channel- love all things planning and organizing, and your monthly favorites too! I greatly appreciate your generous EC giveaways and even though I’ve yet to win, I’ll keep trying and hoping my luck improves 🙂 All the best to you and your family- especially baby Charlotte!